Does your dog like cold weather? To many dogs, Georgia winter conditions are far more hospitable than are the supposed “dog days” of summer. Yet, many dogs are poorly suited for the drop in outdoor temperatures that accompany the winter season. Such dogs may experience hypothermia, frostbite, cracked pads, and stress when left outdoors for an extended period. Hypothermia occurs when a dog’s core body temperature drops below that required for normal metabolic, organ, and body functions. In simple terms, hypothermic internal temperature dysregulation transpires when a dog’s body loses heat faster than it can manufacture heat. Cold ambient temperatures facilitate the onset of potentially lethal hypothermia, especially when there are high winds, a dog becomes wet, a dog is inactive, or a dog is old, young, diseased, or otherwise unhealthy. Symptoms initially include cold skin, shivering (in an attempt to manufacture heat), bright red skin, pale skin (from vasoconstriction), and tachycardia. As the hypothermic condition progresses, confusion, dystaxia, severe shivering, lethargy, paleness, peripheral cyanosis, and/or cold-induced diuresis may ensue. In severe or later stages, as organ systems begin to fail, the symptoms become bradycardia, bradypnea, ataxia, stupor, cyanosis, and finally death. Core heat is primarily generated in muscle tissue, including the heart, and in the liver. Body heat is principally lost through the skin and lungs. Therefore, a healthy, physically active dog will safely withstand cold temperatures better than an unhealthy or sedentary dog. 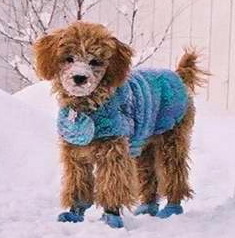 Similarly, a double-coated dog will withstand cold temperatures better than a short-coated dog. Still, extremely cold temperatures or a long period outdoors in mildly cold temperatures, especially when combined with wind or rain, may pose a risk to any dog. If you observe symptoms of hypothermia, you need to immediately commence a treatment plan of external and internal warming. Move your dog to a warm indoor environment. If an indoor environment is not readily available, seek shelter outdoors in an area away from the wind and rain. If your dog is wet, dry your dog thoroughly with a clean towel. Wrap your dog in a thick, dry blanket. Consider using an electric heating blanket and laying your dog atop a hot water bottle wrapped inside a towel (to prevent inadvertent burning). If you do not have an electric blanket, then warm a second blanket in a clothes dryer. In addition, if your dog is alert and able to properly swallow, encourage him/her to drink warm or tepid water supplemented with honey or several teaspoons of cane sugar, especially if you suspect dehydration from cold-induced diuresis. The purpose of the honey or sugar is to replenish carbohydrate levels, as extended shivering may deplete stored glycogen, whereby your dog becomes hypoglycemic. If you acted promptly, you should quickly stabilize your dog. You can tell if your dog is stabilized by checking your dog’s temperature with a thermometer. Dog thermometers are inexpensive and come in various types, including ear, infrared, no contact, and rectal. The normal canine body temperature is between 101 and 102.5 degrees. However, if symptoms progressed to a severe state, especially if the dog’s rectal temperature is below 95 degrees, after you commence emergency dewarming, as a precautionary measure, transport your dog to a nearby veterinary clinic. A veterinarian may treat your dog for shock, add electrolytes, or include extracorporeal membrane oxygenation. Lastly, if you were very late in beginning emergency treatment and your dog has no pulse or heart rate, immediately commence canine CPR while someone helps you to transport your dog to a veterinary clinic. Please note that cold temperatures may allow survival even after extended periods of hypoxia. Therefore, if your dog does not immediately respond to CPR, do not give up. Continue emergency warming and CPR while transporting your dog to a veterinarian. Your veterinarian may include epinephrine and defibrillation to return your dog’s heart and respiration to a normal level. Frostbite is localized damage to skin and adjoining tissue that arises from freezing. Frostbite is most likely to occur in body regions that are farthest from the heart and that are most exposed to the elements. In a dog, frostbite is most frequently observed in the tail, tips of the ears, foot pads, and scrotum. When a dog’s body begins losing heat due to cold ambient temperatures, wind, or moisture, vasoconstriction occurs that concentrates blood in the brain and viscera. Vasoconstriction helps maintain a dog’s core temperature, but reduces the amount of warm blood available to the outer layers of skin. Consequently, freezing of tissue is more likely to occur. Frostbite has several levels. The first level of seriousness is called frostnip, which is characterized by coolness and loss of circulation in body tissues, but without concomitant tissue damage. The symptoms of frostnip include itching and pain, along with pale white or blue discoloration. Frostnip only affects the outer layers of skin. Due to desquamation, permanent skin damage is unlikely to occur. However, associated peripheral nerve damage may permanently reduce your dog’s ability to detect changes in temperature. The second level of seriousness involves freezing and hardening of the outer layers of skin. The pain is greater than with frostnip. The skin may turn dark red or black. Blisters and chilblains may occur either immediately or several days later. The skin will likely heal after weeks or months of treatment. However, permanent peripheral nerve damage in the area is highly likely. The third level of seriousness is frostbite, where adjoining tissue below the skin also freezes. The area will be temporarily paralyzed and become very hard to the touch. The skin may turn black, either immediately or after several days. The fourth level of seriousness is deep frostbite, where muscles, tendons, blood vessels, and nerves all freeze. The area becomes very hard and local paralysis ensues. The skin will immediately turn black or will turn black after several days. Gangrene may develop, which may result in amputation. As you can plainly see, regardless of whether the victim is a dog or a human, frostbite is painful and serious. If you observe symptoms of frostnip or frostbite, remove your dog from the cold immediately and commence a warming process similar to that for hypothermia, especially since hypothermia and frostbite are frequently comorbid conditions. 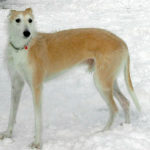 However, avoid movement of the frostbitten area, either by the dog or by you during the treatment process, and avoid any action that may inadvertently result in refreezing of the tissue, which will increase the amount of damage. If possible, splint or wrap the localized area to prevent movement. However, avoid any pressure contact, such as rubbing or massaging. Warm your dog with blankets, electric blankets, and/or a hot water bottle wrapped in a towel. To encourage peripheral warming and peripheral circulation, immerse the affected area in a warm bath. Alternatively, wrap the affected area in a damp washcloth soaked in warm water. Once you commence emergency treatment, while you continue to attend to your dog in the back seat, have someone drive you to a local veterinarian. Your veterinarian will construct a short term and long term treatment plan that will likely include debridement and that may include amputation (in severe cases). Until the area totally heels, your dog may need to wear an Elizabethan collar to prevent chewing and self-mutilation that may arise from chronic pain. In cases of frostnip, healing may occur in a few days. In cases of frostbite or deep frostbite, healing may require several weeks or months. Moreover, total heeling will not occur if gangrene arises. Unfortunately, severe frostbite often leads to permanent localized complications, including changes in temperature sensation, paresthesia, osteoporosis, arthritis, and cancer. Cracked pads most frequently occur when a dog is exercised on cold, abrasive surfaces, such as concrete; when snow or ice accumulate between the pads; from contact with sharp objects, such as metal, stones, burs, or thorns; or from complications from abrasive indoor chemicals or outdoor road salt. Symptoms include frequent licking of the pad area, dry pads, and bleeding. Treatment includes thoroughly cleaning the pad with antibacterial soap and water, applying a topical antibiotic, applying a moisturizing ointment, such as Bag Balm (but only until the wound heals- pads optimally should be hard and tough, not soft), taping a sock or gauze around the affected paw, or applying a purchased bootie to the paw. Cracked pads will usually heal in anywhere from several days to two weeks. In the interim, have your dog wear an Elizabethan collar, so that he does not chew the affected area. In addition, to avoid compensation injuries that may occur due to gait adjustments that arise from the pain, limit your dog’s activity until the injury heals or at least until he appears pain free. However, if the crack is deep or bleeds profusely, you should visit your veterinarian. Your vet may need to anesthetize your dog to properly clean a deep wound and may need to cauterize excessive bleeding. In addition, your vet may elect to prescribe antibiotics. Stress may occur when a dog is left outdoors in the cold for extended periods. Shivering, fear, and confusion that may arise from a dog left outside in the winter without shelter may cause associated psychological stress. In turn, general physical psychological stress may cause, anxiety, timidness, depression, irritability, aloofness, clinginess, anorexia, and other behavioral changes. Similarly, the physical stress that occurs from the cold may cause diarrhea, anorexia, weight loss, dehydration, and hypoglycemia. The best treatments for stress are prevention and environmental change, so that the stress does not occur in the first place. As implied in the opening, many dogs love cold weather. Nevertheless, certain profiles of dogs are more at risk when exposed to cold winter weather. In addition there are a number of compounding environmental risks. Furthermore, be aware that all dogs are potentially at risk. Even Nordic breeds, such as Siberian Huskies and Alaskan Malamutes, can suffer from hypothermia, frostbite, cracked pads, or stress if they are left outdoors for an extended period during cold winter weather, especially if one does not evaluate pertinent risk factors and take proper precautions. Thus, no dog is immune to risk, but the following factors increase the risk. Age– Puppies and senior dogs are more at risk than are young adult or middle-aged dogs, since they have a less effective ability to thermoregulate. Small breeds and breeds with short legs– Dogs that are lower to the ground experience more conductive heat loss than do dogs with longer legs. Dogs with short coats– Double-coated dogs have an insulating undercoat underneath their coarser outer coat. However, short-coated dog breeds that do not have undercoats will suffer more radiant heat loss when exposed to cold temperatures. Moreover, they will suffer more convective heat loss during windy conditions. Very thin dogs– Thin dogs will have a greater amount of body surface area exposed to the elements as a proportion of their overall weight. Therefore, they will suffer a greater amount of radiant heat loss. Overweight dogs– Overweight dogs have less muscle as a proportion of their overall body weight. Since muscular activity, including shivering, manufactures heat that maintains the core temperature, an overweight dog is less likely to efficiently produce heat. In addition, the hearts of overweight dogs must work harder to pump blood throughout the body, which creates less efficiency when heart activity is needed to maintain core body temperature. Lastly, overweight dogs are more likely to be sedentary. Sedentary dogs– A dog in motion is better able to maintain its core temperature than is a sedentary dog. Health– Certain disease conditions raise the probability of a dog developing hypothermia. Heart disease, circulatory disorders, diabetes, adrenal disorders, and hypothyroidism may interfere with thermoregulation and predispose a dog to develop hypothermia. Similarly orthopedic disorders, including arthritis, may prompt a dog to become less active, which in turn reduces the dog’s cold tolerance. Injury may also pose a dog to greater risk. Underfed dogs– Dogs that are underfed will have less glycogen storage and are more likely to become hypoglycemic and hypothermic. Dehydrated dogs– Dehydrated dogs become hypotensive and are less able to thermoregulate. Wet dogs– Dogs in the rain and dogs that swim in cold weather are significantly more at risk for hypothermia. Water disturbs the insulating properties of the undercoat, which makes the dog more prone to radiant heat loss and convective heat loss. In addition, water acts as a conductor that magnifies conductive and radiant heat loss. Dogs that do not have protection from the wind or rain– Wind magnifies convective heat loss by disturbing insulating air pockets maintained within the undercoat. Rain acts as a conductor for heat loss. Therefore, a dog exposed to the elements is at greater risk than is a dog that has access to outdoor shelter that provides a wind and rain barrier. Lack of acclimation– Dogs can physically and psychologically acclimate to cold weather. Consequently, a dog that is usually an indoor dog is at greater risk. Weather conditions– Temperatures below 45º F, windy conditions that bring the wind-chill factor below 45º, and rain increase the risk of hypothermia. Time outdoors– The amount of time the dog spends outdoors without proper shelter will increase the probability of the dog developing hypothermia, especially when considering the other risk factors mentioned above. Nevertheless, by taking proper precautions owners and dogs can safely enjoy the cold winter months. Below are a number of preventive strategies. Bring your dog indoors during the day and definitely during the night– Many people still prefer the outdated concept of the outdoor dog. In addition,, many people would consider bringing their dogs indoors, but are hesitant due to housebreaking, chewing, or allergy problems. First, for those believing in the outdoor dog, CPT’s response is that dogs are pack animals that wish to congregate with their pack members. Thus, unless you wish to join your dog outdoors, keeping your dog alone outdoors is not only physically inhumane, it is also psychologically inhumane. Second, for those concerned about housebreaking and chewing, almost all dogs can learn proper household manners as long as you implement proper prophylactic, training, and behavior modification methods. If you are uncertain how to housebreak or train your dog, we urge you to contact a CPT trainer or behaviorist. You will be surprised how easy it is to train your dog to become an enjoyable household companion. Third, if you are concerned about family allergies, then bathing your dog more frequently with oatmeal shampoo, brushing him frequently, and supplementing his diet with omega 3 and 6 fatty acids should reduce the amount of dander that he sheds in the house. In addition, frequent vacuuming with a quality vacuum that has a HEPA filter should enable you and your dog to congregate together indoors without a lot of sneezing. Provide outdoor shelter– If you need to leave your dog outdoors for extended periods during the winter months, consider purchasing a dog house or Dogloo® that provides cover from the rain and wind. At the least, provide him a covered area, such as underneath a deck that also has vegetation or other features that provide protection from the wind. Provide ample water– To prevent dehydration, make sure your dog has ample fresh water indoors and outdoors. To prevent outdoor water from freezing, use a ceramic or plastic bowl and raise the bowl off the ground. Purchase a sweater and raincoat– Especially if your dog is short coated, short statured, or short-legged, consider purchasing a sweater for your dog for use during cold and windy weather and a raincoat during rainy weather. Purchase booties– Booties are very useful to prevent cracked pads and to extend the amount of time a dog can safely remain outdoors. The booties will reduce conductive heat loss from the foot pads. Booties are definitely pertinent if you wish to exercise your dog long distances in cold weather or if there is snow or ice on the ground. Feed more (or less)– Your dog will have a higher resting metabolic rate if he is outdoors frequently during the winter. Therefore, to maintain glycogen storage, the ability to thermoregulate, and proper body weight, you should increase your dog’s rations during the winter months. On the other hand, if you and your dog will spend more time indoors during the winter and you will exercise your dog less, whereby he will be more sedentary, then consider reducing the quantity of his food rations. Do not swim your dog– Swimming during cold weather dramatically raises the likelihood of hypothermia and frostbite. Avoid leaving your dog in a cold car– The danger of hot cars is better known, but cold cars are also potentially dangerous. Cold cars can become like refrigerators. Moreover, your dog will likely remain sedentary when left alone in the car. Keep your dog healthy– A dog that is the proper weight and that is healthy will be able to safely and enjoyably withstand a greater amount of time outdoors during the winter. Acclimate your dog– If you wish to go winter camping or on a long hike, first acclimate your dog with shorter outdoor excursions. Consider the weather– Evaluate the temperature, wind, and humidity before leaving your dog outside for long periods or undertaking a camping trip, long hike, or long run. In addition, consider whether there is snow, ice, or moisture on the ground. A sweater and booties provide comfort and safety on a cold winter day. Lastly, for cat owners who have outdoor cats many of the same rules apply. Yet, there is one additional rule for keeping cats safe- check your car engine and underneath your car before leaving your garage or carport. Cats often like laying alongside car engines or underneath cars. To avoid inadvertently injuring your cat from the fan blade or the tires, please check your car before departing. The winter months present the risk of hypothermia if a dog is left outdoors for an extended period. Certain breed profiles, ages, health conditions, and behavior and specific environmental conditions increase the danger of a dog developing hypothermia, frostbite, cracked pads, physical stress, or psychological stress as a result of exposure to cold winter weather. Nevertheless, there are a number of preventive strategies that can make the wintertime both enjoyable and safe. The number one consideration is bringing your dog indoors. Dogs are pack animals that prefer the indoor company of their human pack members. If you are hesitant to bring your dog indoors due to a concern about damage from housebreaking or chewing, then a consultation with a CPT trainer/behaviorist should enable your dog to become a responsible household companion. Similarly, if you are concerned about human health from dog dander, there are grooming and diet strategies that should enable your dog to remain indoors without sacrificing human health and comfort. © Mark Spivak and Comprehensive Pet Therapy, Inc., November 2014. All rights reserved. Several sources categorize mild hypothermia as a rectal temperature between 90 – 99º F, moderate hypothermia as a rectal temperature between 82 – 90º F, and severe hypothermia as a rectal temperature below 82º. Nevertheless, to better provide for the safety of your dog, CPT recommends visiting a veterinarian if you observe severe physical symptoms and a rectal temperature of below 95º.